The fifth edition of Manifesta, the European Biennale of Art of New Europe – or M5 in short – held in San Sebastian, Spain (or more precisely, in the Basque region of Spain, an hour from Bilbao and near the border with France) opened on June 12, 2004. M5 is another case study about the state of things in cultural policy, processes of art exhibitions, influences of the art market and about the new/old divide story in Europe. With one word M5 (which will be open until September 2004) cries out only one slogan: It’s politics. Precisely as it was repeated over and over again also during the press conference that this is an art manifestation that has nothing or almost nothing to do with politics! But I can say that M5 is all about politics and it is to be found on several levels: within the EU, the new Europe, the way in which the cultural space of Europe is administered and the way in which the market intervenes in the field of art. This is why perhaps this putting it into the parenthesis of politics – and repeatedly underlying this art move as one not political, but as a move into the future of art without politics – is, at least, the most suspicious gesture of M5. But as always let us proceed step-by-step. The M5 presents about 30 art projects in several institutions throughout the city, bypassing some of the most important spaces in San Sebastian, precisely those that have acted as critical art production sites for more than a decade, and publishers of magazines for critical interpretations in the city. To name one here at least: Arteleku. It is mentioned as a production facility for M5, but not as the producer of concepts and an important exhibition site within San Sebastian. Actually, this forced me to think about Manifesta (M3) in Ljubljana when the same process happened and where Gallery Škuc, Gallery Kapelica and Metelkova, all places of historical importance, were left out and not taken as exhibition locations and critical reference points while constructing the M3 project. A paradox indeed, if we know that Ljubljana became Ljubljana – “the trendy city” – precisely because of these spaces and not because of the official institutional mastodons that were taken into account for M3. In this way then, Manifesta 5 produces what I call the evacuation of the historical and cultural specificity of certain territories. In Ljubljana it was concrete spaces and in San Sebastian it is besides these concrete locations an even more interesting process of evacuation. At M5, no artist from the territory around former Yugoslavia, Romania, Bulgaria, Albania, Hungary, etc. is taking part in the exhibition. At first sight, it seems as a punishing gesture especially toward the Balkans. It seems that the cannibalization process by Germany and Austria is now completed and following the number of exhibitions dealing with the Balkans, it is no longer necessary to go to searching for new artists. Let us be precise, Manifesta as a concept was from its beginning presented as an opportunity for newer generations of not yet well-known artists, and dealing with the new map of European art and culture after the fall of the Berlin Wall, in order to connect East and West, South and North. But what we get in M5 is a completely unbalanced situation of names; most of them affiliated with the current art market and gallery spaces. For example, I asked one of the artists, Misha Stroj (born in Ljubljana, which he left when he was 3, heading with his parents to Vienna), how it came that he was selected? As it is also a must, according to Iara Bubnova, that the curators have to travel to different spaces in Europe! Which was not possible to be said for the M5 curators. They did not come to Austria or to Slovenia, for example. He told me that he just received a mail from the curator! Stroj is very well rooted within the gallery system (good for him) and very well rooted in the mentality of commercial western art. And so he is circulating, as are many presented at M5, circulating between magazines, private galleries, etc. ; they are “children” of Flash art as well, of the community of new artists presented in Flash art. This is a good point now to emphasize who the curators of M5 are: Massimiliano Gioni is the artistic director of the foundation Nicola Trussardi in Milan. He has also been invited by artistic director Francesco Bonami to curate a project on Italian contemporary art for the next Venice Biennial. He is part of the curatorial team for the presentation of the recent acquisitions of the Dakis Joannou collection in Athens, 2004. He has held the position of US editor for Flash Art magazine from 2000 to 2002. Marta Kuzma is the “ex”, ex-Director of WPA, in Washington, DC (2000-2002), ex-Director of the Soros Center for Contemporary Art in Ukraine and ex-Director of the International Exhibitions Programme at the International Center of Photography, NYC. 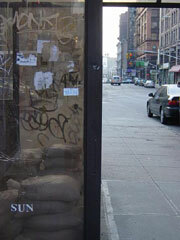 At present, she is curating a project with Dan Graham entitled Passaic which is set to open in NYC in 2004. The powerful backgrounds of both curators indeed was seen as fully and consciously posited by them as well, while dealing and thinking about art. At the press conference, which was something like a modern circus situation (which they always are, from my point of view), these attitudes were more than underlined. When Alexander Brenner and Barbara Schurz, similarly as at Ljubljana’s Manifesta 3, but this time with no real effect, made their usual public protest action, Marta Kuzma did not stop in her talk, not for a second, and even commented: “…precisely such type of politicisation is what we wanted to prevent with M5!” In the meantime, Brenner and Schurz were removed so quickly that we could barely read their banner: “Death to the king!” Okay. It is true; such actions have little function today. Why? It is obvious that it took hundreds to be injured in Madrid in order to change the previous reactionary government. Zapatero is smart, but the unbearable bloody scenes in Madrid just before the election brought him to power! What was a new M5 approach in relation to Brenner and Schurz though, in contrast to Ljubljana, where the press conference was a pure pathological situation, and the board acted as nothing, absolutely nothing had happened and continued the press conference immediately, at M5 the situation was hysterical. Kuzma talked and talked, giving us a lesson of why they have to protect us from such events, as the one by Brenner/Schurz at the M5 press conference. But I do not want to be protected! I stated at the beginning that it is a whole process of abstraction and evacuation that is going on, eradicating places, and artist’s territories. It is worth noting that while the evacuation of artists from several countries from the East of Europe happened at M5, which I listed, on the other hand it is also interesting to note that no one from so-called former (?) Western European countries were left out from M5, at least an appropriate representative was found for each one. Even more, the artists were abstracted also with the way their works were presented, or better to say, “packed” at M5. M5 confirms the consumerist logic of the space where they are presented. M5 is similar to San Sebastian’s cosy middle class tourist flavour that expanded from the site into the works. The works look all the same from the outside and it is always necessary to verify where these works come from and to think carefully not to mix them up. Maybe it is only when works are using children that things are at least different. Children abused and transformed into image prostitutes and child politicians playing in videos as it were in the Ukrainian work and in the work by British artist Gillian Wearing, it is the children who come from the East! Gillian Wearing’s work meditates about Albania through an Albanian child in serious clothes as former communist politicians presenting Albanian pasts and making mistakes when reading a difficult text in Albanian about a monument’s past history in Tirana. So the process of evacuation at M5 is triplicated: certain very precise territories are missing, certain very precise artists are missing and certain very precise art concepts are missing or if not, then they are all abstracted to such a degree that they can stand for each and nothing. And in the end it is very interesting to add that although it seems that it is not a topic connecting M5, I can state that one topic is possible to be recognized: the past history as a romance. Many of the works go back to the 1970s and 1960s in the East and West with the stance of thinking about them in a kind of retro-romantic subjective attitude – collecting old films and displaying them as diptychs and triptychs. Most of these stories are individual and linked to the artists’ very subjective points of views. Again it is possible to say: we all had a past and these pasts’ stories are very similar indeed. Welcome to a Europe of no differences. Maybe the only really political work is the hard-boiled documentary work about Palestine and Israel by two artists each coming from the respective territories. Eyal Sivan and Michel Khleifi’s documentary film Route (2003) lasting 4 hours, and I spent them fully in front of the projection canvas, explores the virtual borders created by a 1947 United Nations Partition Plan. The documentary has no romantic or melancholy off-voice or a subjective historical point in the structure. The off-voice is a trickster that easily allows for the manipulation and softening of political contents, and it is used in most of the works. M5 at least opens a space for the radicalization of the position of the structures of contemporary documentaries. Route is a pure political stance. I asked myself how it is possible that this film (seen as a mistake actually, if we think about the concept of M5) is presented within M5? It is a film that is not about Europe actually, but about the Other of Europe and it is taking place outside of the new Europe!